Starting from the version 4.70 of the program it is possible to convert the videos recorded with Icecream Screen Recorder for Windows to other output formats supported by the screen capture tool. Please note that this feature is available for the videos that were already recorded with Icecream Screen Recorder and these videos can be converted from the History panel of the program. You can find the step-by-step tutorial on how to convert recorded videos with Icecream Screen Recorder for Windows right below. If you don't have the program yet download Icecream Screen Recorder and install it. Open the screen recorder once it's installed. 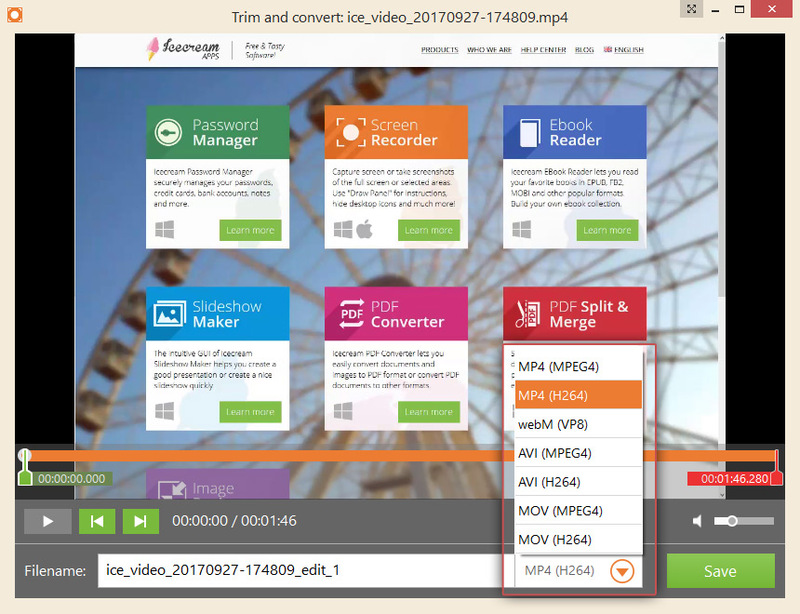 The conversion option is available for the videos that were recorded with the use of Icecream Screen Recorder and are listed in the History panel of the program. The tutorial on how to capture screen can be found over here. Once a video is recorded with the screen recorder the main window of the program will be shown as History panel with the information about all the created videos and screenshots as well. To access the video editor panel pay attention to the “Edit” column of the History panel that is located in its right side. Hit the pencil icon in the “Edit” column that is in the same horizontal line as the title of the video to be converted. Note: If the History panel of yours doesn't look like the one on the screenshot and it doesn't contain the “Edit” column, most likely you are using an outdated version of the program,. The version number can be found at the top of the Settings panel, make sure it is not lower than 4.70. The video editor panel will be opened right away after clicking the pencil icon. Pay attention to the bottom of the panel. Press the round button with a triangle inside standing next to the current video file's format information to open the list with all the available output video formats. Select the format to which the video should be converted. Press the green “Save” button to convert recorded video. The conversion progress bar will be shown while the video is being processed. When the output video file is ready, a new window will appear in the program. The “Open folder” button will open the folder containing the output folder. The “Continue” button brings you back to the video editor. The “Close” button closes the video editing panel and brings you back to the History panel of Icecream Screen Recorder for Windows. The new converted video will be further available from the History panel of Icecream Screen Recorder.